Allegra Boverman/Gloucester Daily Times. 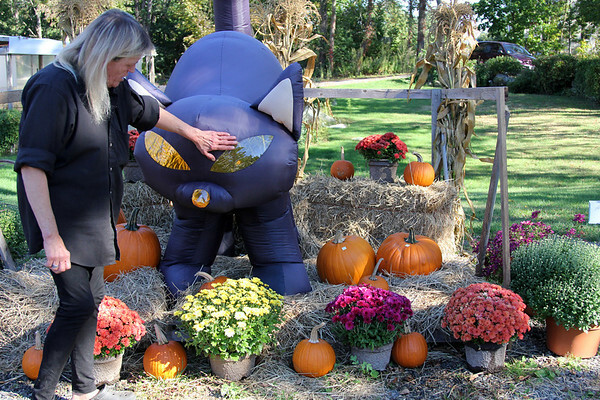 Mary Phillips of Rockport, playfully pats the head of an inflatable cat on display at Blue Gate Gardens on Tuesday. She calls the cat Boo, because her own cat, Willow, also known as Boo boo, has been missing since August. She's giving attention to the display in the meantime, she jokingly said. Boo, an indoor cat, has been seen in her neighborhood, in the King and Forest streets area, he has eluded capture, though neighbors are on the lookout for him and put food out. Boo is a black cat with bright green eyes and a white tummy. If you happen to spot him, let Phillips know and call her: 978-879-6038.